Lately there has been a lot of hype over natural beauty products that have been hitting the industry for years now. With so many brands out there and no mainstream marketing, I have been unable to further my knowledge on what products are comparable to the makeup items I've using from the drug and department stores. It was brought to my attention from Vegan Cuts that there is a way to experience natural beauty regimens without having to think much about it. Vegan Cuts Beauty Box is a monthly subscription that enables you to try out these natural/vegan cosmetics for $19.95 a month. They are loaded with brands I've personally have not heard of, but nether-the-less product names do not matter as the products are quite brilliant. The items in this box include a couple samples and one full sized product. Balanced Guru Energy Mist: The box is way excessive for such a small babble. I do however enjoy the mist as it is very refreshing in the mornings after my morning facial cleanse. Zabana cleansing bar and Enfusia are essential items for everyday usage. I have not been able to test these items because I am saving them for my future travels. I will say I am obsessed with the scent of the bath salts. The aroma is very similar to the scent of the Zum frankincense and myrrh soap, which is one of my all time favorites scents in the world. The Pacifica bb cream is a product I am very familiar with after receiving it in past beauty subscriptions. Its a very light coverage tinted moisturizer in my opinion. This is the only full sized item in the beauty box. I love this item so much! The Emani hybrid creme in 1042 Speechless leaves me without words. Its very versatile, though I've only used it on my cheeks. It leaves a nice hint of color and addictive glow when applied properly. The glittery specks do show up on the skin, but its not chunky glitter. Its very refined. The glow will last a good 6-8 hours in summer to fall weather. 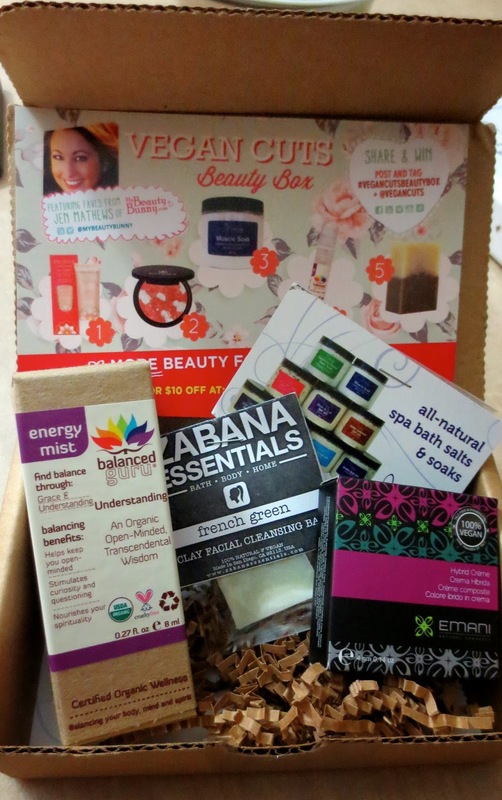 The August Vegan Cuts Box was quite an experience for me, being new to the natural/vegan beauty industry. It has open up new doors for me personally, knowing that these items are just as fab as my essential items from the drug and department store. I can't wait to see what's in store for this beauty box!